I just made this up, and Krista's parents really liked it. A great holiday side dish. Just subtract the butter and it'd be totally Lenten. Blanche about a pound of fresh green beans in boiling water 2-3 minutes. Chop up a few cloves of garlic really fine. In a saute pan on medium-high heat, saute garlic in butter, adding after a minute or two a few tablespoons of honey. Add in a small amount of high quality hot red chili paste (I use about half a teaspoon to about two tablespoons of honey). Let bubble and simmer a bit... carmelize. 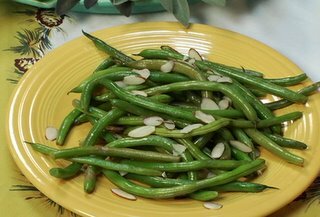 Drain green beans, quickly toss beans into honey-garlic-chilli sauce. Thoroughly coat beans in mixture 1 minute. Pour into buttered (or olive oil) baking dish, spirinke sliced almonds over top, bake in oven further 5 minutes. (The picture here is without the honey-garlic-chili sauce). posted by Matthew Francis | 12/20/2005 10:48:00 a.m.
Matthew, I love how much you love food. Did you miss your calling as a chef? This sounds delicious. I'm going to make it tonight. I can't wait for Christmas. And I am definitely trying out your great tips on the turkey. I'm getting hungry just reading these posts. And you make bread too, don't you? Scholar, chef, writer of western novels; what a renaissance man you are Matt! That's really sweet of you to say, Victoria. I'll be the first to admit most of my adolescent Saturday afternoons were spent watching Julia Child and the Frugal Gourmet on PBS. So when are you going to put on your amazing Caesar salad? It's HANDS DOWN the best I've ever had!